fficient estimators of the linear model than OLS (ordinary least squares). 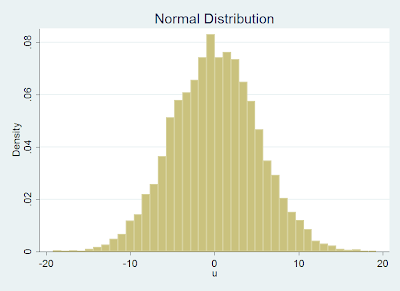 * These cases are characterized by data in which tails of the errors tend to be wide. * With errors distributed normally we know that OLS is the most efficient estimator. * and generating the error term from an inversion of a uniform draw. * Seems to be working well, let's simulate it 1,000 times. 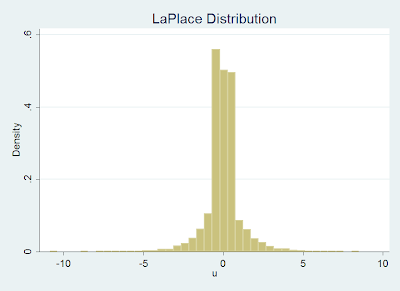 simulate OLSb=r(OLSb) LADb=r(LADb), rep(1000): OLSLAD 1000 "norm"
simulate OLSb=r(OLSb) LADb=r(LADb), rep(1000): OLSLAD 1000 "laplace"
* the distribution of errors follows a LaPlace. * the estimator choice is LAD.